Broodhold is a PS4-exclusive Strike that was released under the Forsaken expansion. 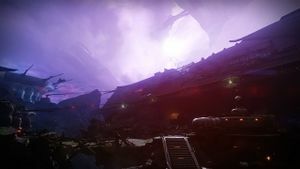 Guardians must breach the Tangled Shore's crashed Hive warship and destroy the nest inside of it, in an effort to drive the Hive out of the Shore. The mission will go awry when the nest's source reveals itself, requiring Guardians to rise up to defeat the threat. All dialogue is spoken through the Ghost's comms. A Strike Team transmats to the Jetsam of Saturn, and plows through the Hive forces in the area. The Spider: Infestations starts small. Vermin goes scuttling through your home, and you think, "It was just one..." But the next thing you know, your Shore seethes. Guardians! Hive! And you dream of ways to exterminate them...The Hive have carved a nest deep into my Shore. Destroy it, and I'll consider it a partial reparation of your debts. The Spider: Two star-crossed lovers have sullied my Shore: our old friend the Mindbender — may he rest in pieces — and In Anânh, a Hive Brood Queen, traitor to her kin. Eliksni have crossed lines with the Hive in the past, but never at this scale. I'm told there's a whole nest seething beneath my Shore, and I want it exterminated. Snuff it out, and I'll contemplate your debts to me. The team enters the Hive nest in Hellrise Canyon, where the Fallen are struggling to drive the Hive out of their hole. Ghost: Fallen — up ahead. The Spider: The Eliksni have no love for the Hive. They understand no language but kill or be killed. The Spider: Houseless scavs, trying to claim a bit of land for themselves. Dead men walking, nothing more. The Fireteam plows through both sides, then pushes past several packs of Thralls into the canyon. Along the way, they find the floor covered in flames made of void energy. They get past it, and find a Knight with a strange glow guarding the chiten wall leading to the nest. Ghost: Detecting elevated levels of Ether in that Knight. They kill it, but it's worm does not die. One of the Guardians pick it up, and it begins to explode. Ghost: Strange. The worm is infected with Ether, too. Ghost: This worm is radiating Ether, too. The Spider: [chuckling] Feed a Captain, curse a Thrall. Poison a Knight. The Guardian drops the worm into the chiten. Both it and the wall explode, opening the way into the next part of the canyon. More Fallen and Hive are fighting, and the Fireteam must push through both. The team gets past them, and pushes past another segment of void flame on the floor. They find the hole leading to the nest, but it's guarded by Hive and blocked by an abnormal growth. Three Ether-poisoned Knights are scattered around the area, which the team dispatches. Using the tainted worms, they are able to damage the growth blocking the way. Screaming bloody murder, In Anânh, Brood Queen bursts out of the growth and attacks. The team unloads on her, but she escapes back into the hole in the ground. Fortunately, the growth is destroyed, so she can be followed. Ghost: I've never heard of a Brood Queen so close to the surface. Mission reports from the Hellmouth on Luna don't even mention them. The team follows her deeper into the nest. She lays more void traps, but they are avoided. The way forward is impeded by more hive, including an Ogre and a Shrieker. On top of this, a Knight from the Prison of Elders is trying to escape into the nest. While the Knight can be ignored, the other interlopers cannot. Once they are eliminated, In Anânh dispatches a Shade of herself to slow them down. The shade Covers the way forward with more flame traps on the floor, forcing a confrontation. Ghost: This is right out of Oryx's playbook. Ghost: There's our Queen again! The Shade attacks using void traps on the floor and barrages of Void projectiles, but the team manages to drive it off, clearing the path. Pushing past a pack of Thrall, the teams reaches the deepest part of the nest, leaving the Brood Queen cornered. After detonating another Ether worm, In Anânh appears out of the growth, ready to fight. After she is weakened, she calls upon a Worm God, giving her the power to switch place with her shade. to switch places with her shade. Once the Shade is wonded enough, In Anânh returns, and splits her Shade from herself, forcing the fireteam to contend with two In Anânhs at once. The team manages to kills the real Brood Queen, but her Shade lives on to continue the fight. However, the team manages to put the Shade down, too. Ghost: Spider. We cleared out the nest. The Spider: Ooh, so quickly? Why, if it was that easy, I don't think this counts toward your debts. I want a fair trade. Ghost: That wasn't the agreement. Broodhold is the second strike to feature a Hive Wizard as a strike boss in Destiny 2, the first being Strange Terrain.